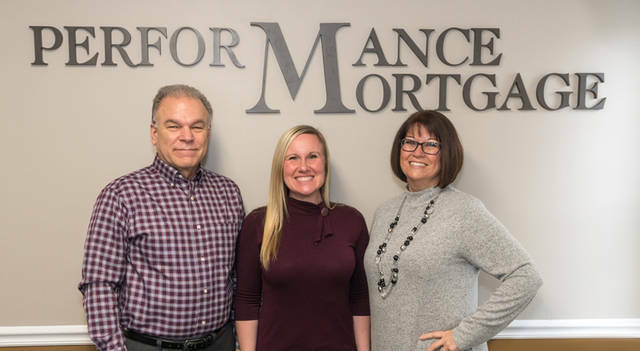 Performance Mortgage owners (l-r) John Heath, Desteni Mason and Kristina Heath announced organizational changes to their business. GREENVILLE – Local mortgage broker Performance Mortgage revealed its new logo and website, coinciding with changes to the ownership team and a renewed go-to market approach. In late 2018, Performance Mortgage founder Bill Mason stepped down from an ownership role in order to focus on his own personal development. While he remains active within the organization as the broker and a mortgage loan originator, his departure led the remaining owners – Desteni Mason, John Heath and Kristina Heath – to re-evaluate their business approach and long-term growth goals. For the past several years, each member of the ownership team achieved a high level of success investing in and growing their own personal brands – Desteni Mason with Mason Knows Mortgages, and John and Kristina Heath with Your Expert Mortgage Team. While this go-to-market approach was successful for Mason and the Heaths, they made the decision to eliminate their personal brands, coming together as a team to focus on growing the Performance Mortgage brand. One of these new markets includes Fort Wayne, Indiana. After a local mortgage lender went out of business in late 2018, Performance Mortgage stepped in. It hired several mortgage loan originators and opened a new Fort Wayne branch. Performance Mortgage’s new website is designed to help buyers at all stage of the home-buying journey, including first-time home buyers, existing homeowners looking to refinance or upgrade and buyers looking to purchase a vacation home or investment property. The new website launched Jan. 21 and is located at the same address, www.performancemortgageone.com. The new logo is symbolic of the Performance Mortgage mission, which is to be the best mortgage lender possible, finding the right home mortgage solution for each person’s life situation and serving as a guide and partner throughout the process of achieving their dream. The four quadrants of the house icon offer a dual symbolism: the four quadrants come together as a team just as the Performance Mortgage team has done, and each quadrant is unique, just like every home buyer’s situation and solution is unique.